Co-organized by Every Woman Every Child, the Global Partnership for Education, Sanitation and Water for All, the Scaling Up Nutrition Movement, and Zero Hunger Challenge, the event featured high-level speakers such as President Michelle Bachelet, of Chile, Ms. Aung San Suu Kyi, State Counsellor and Minister for Foreign Affairs of Myanmar, and Dr. David Nabarro, the UN Secretary-General Special Adviser on 2030 Agenda for Sustainable Development and Climate Change. To achieve the sustainable development goals, it is imperative that we work in partnership and across sectors to ensure woman, children and adolescents everywhere access adequate, diverse and nutritious food, quality health care, education, sanitation and clean water – which will help them survive, grow strong, get an education, become resilient and thrive. In turn, so will their communities and countries, breaking poverty cycles and contributing to a more inclusive, sustainable, healthier and more prosperous future for all. The message was loud and clear in the voice of Sira, a ten-year old girl from a video animation launched at the event. 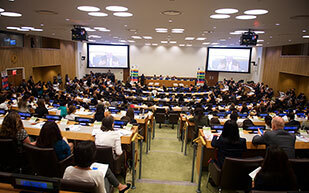 The event reflected the leadership of the UN Secretary-General Ban Ki-moon, who addressed the audience in a video message and highlighted the hard work and commitment to bringing together an array of different actors to unite around some of the most intractable challenges that people face in their daily lives. 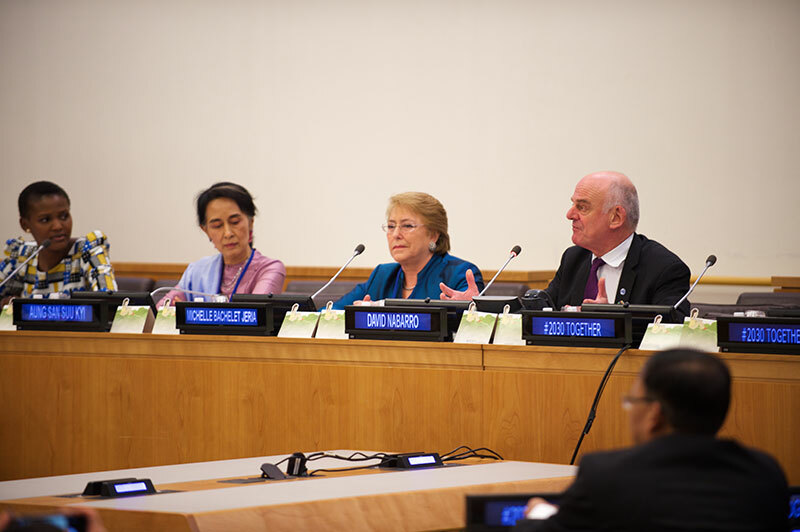 “From the time he assumed office, the Secretary-General recognized that partnership brings results and he focused on the power of partnering as a specific element of the United Nations’ work,” said Dr. David Nabarro, Special Adviser Special Advisor on 2030 Agenda on Sustainable Development and Climate Change. The partnerships that co-organized the event understand the importance of working with a variety of stakeholders to achieve lasting impact in their fields. 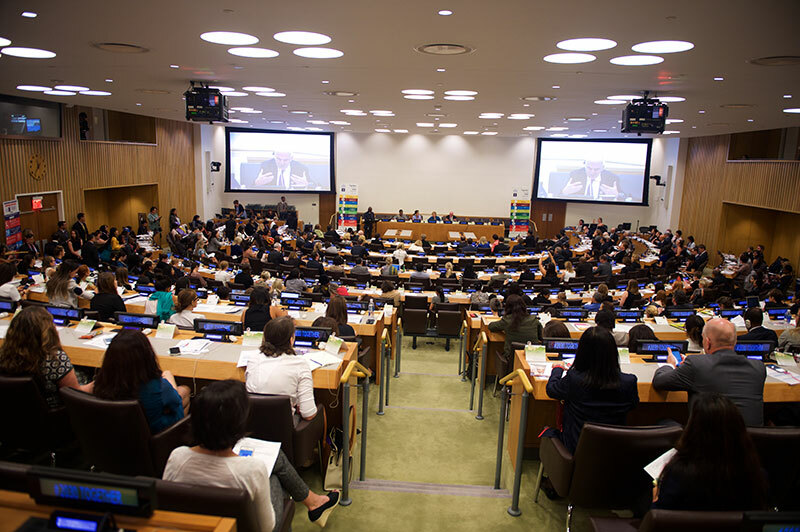 However, the 2030 Agenda commits us to breaking down the walls between sectors, as David Nabarro reminded attendees. “In SDG 17, the member states explicitly emphasized the role of partnerships; putting them at the heart of the 2030 Agenda. Partnerships that engage citizens and all stakeholders will build movements for change; making possible the transformations envisioned in the 2030 Agenda. To ensure that we leave no-one behind, partnerships must be driven by local stakeholders. This will enable us to address unique, country-specific sustainable development and humanitarian challenges,” added Dr. Nabarro. Ms. Vivian Onano (Kenya) , Partnerships Manager SEED Project, WaterAid America Youth Ambassador & Women Deliver Young Leader. The event also counted on interventions from the following speakers: H.E. Ms. Marie-Claude Bibeau, Minister of International Development and La Francophonie of Canada; H.E. Ms. Julia Duncan-Cassell, Minister of Gender, Children and Social Protection, Liberia; Ms. Helle Thoring Schmidt, CEO Save the Children International; H.E. Ms. Tone Skogen, Deputy Foreign Minister, Norway; Mark Suzman, Chief Strategy Officer and President, Global Policy & Advocacy, Bill and Melinda Gates Foundation. 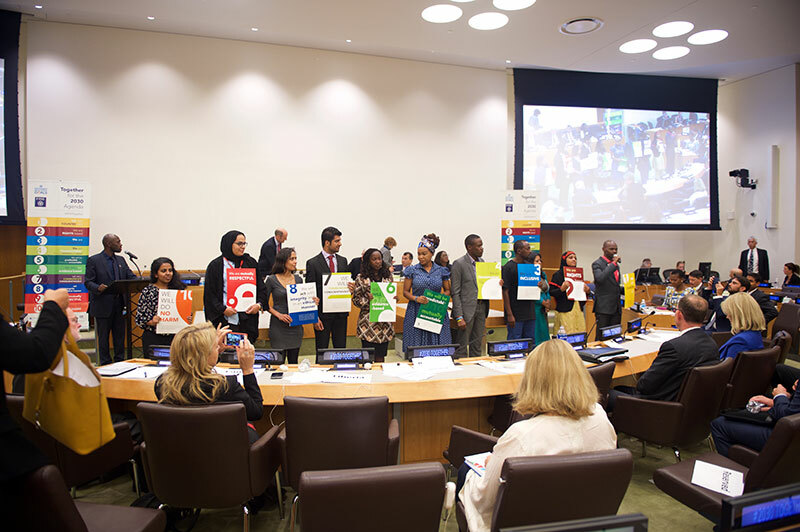 To close the event, young leaders from various organizations, including White Ribbon Alliance, Save the Children, Women Deliver and PMNCH, offered their interpretation of the principles of partnership contained in the Partnership Playbook launched at the event. The young leaders were: Mr. Elman Nsinda, Ms. Anoyara Khatun, Mr. Yosef Ahmed Terku, Mr. Patrick Mwesigye, Ms. Gogontlejang Phaladi, Ms. Tikhala Itaye, Mr. Fsahat UI Hassan, Ms. Salam Abukhadrah, Ms. Hiba Nabulsi and Ms. Jasmine George. Our partnerships are driven by committed countries and their national priorities. We commit to ensuring that countries are at the centre of all efforts to ensure sustainability. Our partnerships will act in accordance with a commitment to uphold the equity, equality and rights of all women, men and children, (building upon the firm foundation of United Nations purposes and principles, as set out in the Charter, and the rights based instruments that guide our partnerships)—ensuring that no-one is left behind. Our partnerships are open to a broad range of stakeholders, including government, civil society, private sector, academia, donors, United Nations agencies—who demonstrate their commitment to our goals and principles. 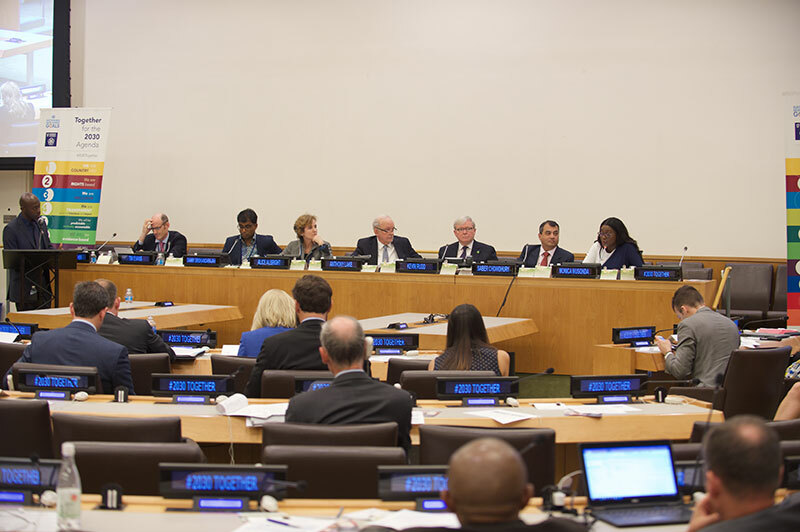 A multi-stakeholder approach is critical for delivering on the promise of the 2030 Agenda. Our partnerships commit to establishing rigorous evaluations of the impacts of collective action and the contributions of our individual partners. Our partnerships will work towards shared outcomes and uphold and strengthen accountability of our partners’ commitments and actions. We will pursue and support evidence-based priorities that will achieve the greatest sustainable impact for the resources available. Across our partners’ countries, sectors and stakeholders we will strive to learn and adapt our ways of working, through the sharing of lessons on what works and what does not—informing progress toward achieving all SDGs. Our partners will manage personal and institutional conflicts of interest with integrity, be consistent with national laws and national development strategies and plans, and align with the priorities of countries with whom we are working. Our partnerships will collaborate in a way that builds trust and respects the contributions and perspectives of other stakeholders. We will encourage actions that contribute to improving the well-being of all people, with careful consideration about negative consequences to people and planet, and clear mitigation strategies.